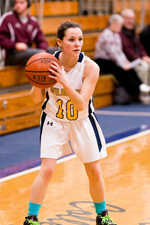 Cazenovia College women's basketball player and West Bloomfield, NY native Haley Zambito made history on January 15, becoming the all-time Caz College record holder for three-pointers made in a career. The previous record of 151 career three-pointers made was set back in 2010 by Colleen Clarke, a member of the College's 1000 point club. Zambito, a junior guard for the Wildcats now sits alone atop this list with 156 career three-pointers made and counting. "This record means a lot to me, it shows me that hard-work, dedication, and determination really do pay off. I'm honored to be a part of Cazenovia College history," said Zambito. As if the record-breaking achievement was not enough, Zambito's contributions to the Wildcats' January 15 matchup against SUNY Cobleskill also helped lead her team to victory. Zambito scored 23 points tying a career high including six pivotal points down the stretch. With 17 seconds to go, Zambito sunk a game-tying 3-pointer and then capped off the night only seconds later with a buzzer beating three as time expired, sealing the 62-59 victory for Cazenovia. Read the full article about Haley Zambito's accomplishments during the Cazenovia College's home game against SUNY Cobleskill game on January 15, 2014.